"Lunar crater" redirects here. For the volcanic crater in Nevada, see Lunar Crater National Natural Landmark. Webb crater, as seen from Lunar Orbiter 1. Several smaller craters can be seen in and around Webb crater. Side view of the Moltke crater taken from Apollo 10. Lunar craters are impact craters on Earth's Moon. The Moon's surface has many craters, almost all of which were formed by impacts. The word crater was adopted from the Greek word for vessel - (Κρατήρ a Greek vessel used to mix wine and water). Galileo built his first telescope in late 1609, and turned it to the Moon for the first time on November 30, 1609. He discovered that, contrary to general opinion at that time, the Moon was not a perfect sphere, but had both mountains and cup-like depressions. These were named craters by Schroeter (1791), extending its previous use with volcanoes. Scientific opinion as to the origin of craters swung back and forth over the ensuing centuries. The competing theories were (a) volcanic eruptions blasting holes in the Moon, (b) meteoric impact, (c) a theory known as the Welteislehre developed in Germany between the two World Wars which suggested glacial action creating the craters. Grove Karl Gilbert suggested in 1893 that the Moon's craters were formed by large asteroid impacts. Ralph Baldwin in 1949 wrote that the Moon's craters were mostly of impact origin. Around 1960, Gene Shoemaker revived the idea. According to David H. Levy, Gene "saw the craters on the Moon as logical impact sites that were formed not gradually, in eons, but explosively, in seconds." Lunar craters as captured through the backyard telescope of an amateur astronomer, partially illuminated by the sun on a waning crescent moon. Evidence collected during the Apollo Project and from unmanned spacecraft of the same period proved conclusively that meteoric impact, or impact by asteroids for larger craters, was the origin of almost all lunar craters, and by implication, most craters on other bodies as well. The formation of new craters is studied in the lunar impact monitoring program at NASA. The biggest recorded creation was caused by an impact recorded on March 17, 2013. Visible to the naked eye, the impact is believed to be from an approximately 40 kg meteoroid striking the surface at a speed of 90,000 km/h. In March 2018 the discovery of around 7,000 formerly unidentified lunar craters via convolutional neural network developed at the University of Toronto Scarborough was announced. Because of the Moon's lack of water, atmosphere, and tectonic plates, there is little erosion, and craters are found that exceed two billion years in age. The age of large craters is determined by the number of smaller craters contained within it, older craters generally accumulating more small, contained craters. The smallest craters found have been microscopic in size, found in rocks returned to Earth from the Moon. The largest crater called such is about 290 kilometres (181 mi) across in diameter, located near the lunar South Pole. However, it is believed that many of the lunar maria were formed by giant impacts, with the resulting depression filled by upwelling lava . central peak, found only in some craters with a diameter exceeding 26 kilometres (16 mi); this is generally a splash effect caused by the kinetic energy of the impacting object being turned to heat and melting some lunar material. In 1978, Chuck Wood and Leif Andersson of the Lunar & Planetary Lab devised a system of categorization of lunar impact craters. They used a sampling of craters that were relatively unmodified by subsequent impacts, then grouped the results into five broad categories. These successfully accounted for about 99% of all lunar impact craters. ALC — small, cup-shaped craters with a diameter of about 10 km or less, and no central floor. The archetype for this category is Albategnius C.
BIO — similar to an ALC, but with small, flat floors. Typical diameter is about 15 km. The lunar crater archetype is Biot. SOS — the interior floor is wide and flat, with no central peak. The inner walls are not terraced. The diameter is normally in the range of 15–25 km. The archetype is Sosigenes. TRI — these complex craters are large enough so that their inner walls have slumped to the floor. They can range in size from 15–50 km in diameter. The archetype crater is Triesnecker. TYC — these are larger than 50 km, with terraced inner walls and relatively flat floors. They frequently have large central peak formations. Tycho is the archetype for this class. Beginning in 2009 Dr. Nadine Barlow of Northern Arizona University began to convert the Wood and Andersson lunar impact-crater database into digital format. Dr. Barlow is also creating a new lunar impact crater database similar to Wood and Andersson's, except hers will include all impact craters greater than or equal to five kilometers in diameter and is based on the Clementine spacecraft's images of the lunar surface. The moon zoo project within the Zooniverse program aimed to use citizen scientists to map the size and shape of as many craters as possible using data from the NASA Lunar Reconnaissance Orbiter. However, it has since been retired. Craters constitute 95% of all named lunar features. Usually they are named after deceased scientists and other explorers. This tradition comes from Giovanni Battista Riccioli, who started it in 1651. Since 1919, assignment of these names is regulated by the International Astronomical Union. Small craters of special interest (for example, visited by lunar missions) receive human first names (Robert, José, Louise etc.). One of the biggest lunar craters, Apollo, is named after Apollo missions. Many smaller craters inside and near it bear the names of deceased American astronauts, and many craters inside and near Mare Moscoviense bear the names of deceased Soviet cosmonauts. Besides this, in 1970 twelve craters were named after twelve living astronauts (6 Soviet and 6 American). The majority of named lunar craters are satellite craters: their names consist of the name of a nearby named crater and a capital letter (for example, Copernicus A, Copernicus B, Copernicus C and so on). Lunar crater chains are usually named after a nearby crater. Their Latin names contain the word Catena ("chain"). For example, Catena Davy is situated near the crater Davy. The red marker on these images illustrates the location of the named crater feature on the near side of the Moon. ^ This term was coined by Soviet explorers of the Moon after beginning of exploration of lunar farside. Later, in 1967, on XIII General Assembly of the International Astronomical Union this word was proposed to be included into the list of generic terms of nomenclature of lunar surface features, but this proposal was declined. So, this term remains only a characterization of the features, but not a part of their names. 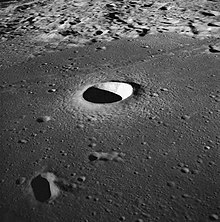 Wikimedia Commons has media related to Craters on the Moon. ^ Pike RJ (1977). "Size-dependence in the shape of fresh impact craters on the moon.". Impact and explosion cratering: Planetary and terrestrial implications; Proceedings of the Symposium on Planetary Cratering Mechanics, Flagstaff, Ariz., September 13-17, 1976. New York: Pergamon Press. pp. 489–509. ^ Quaide, W.L. & Oberbeck, V.R. (1968). "Thickness determinations of the lunar surface layer from lunar impact craters". Journal of Geophysical Research. American Geophysical Union. 73 (16): 5247–5270. Bibcode:1968JGR....73.5247Q. doi:10.1029/JB073i016p05247. ^ Levy, David (2002). Shoemaker by Levy: The man who made an impact. Princeton: Princeton University Press. p. 59. ISBN 9780691113258. ^ "Lunar Impacts". Marshall Space Flight Center. Archived from the original on 2013-05-17. Retrieved 2013-05-18. ^ Dr. Tony Phillips (17 May 2013). "Bright Explosion on the Moon". science.nasa.gov. Nasa Science News. Archived from the original on 26 June 2014. Retrieved 13 June 2014. ^ "New technique uses AI to locate and count craters on the moon". Phys.org. Archived from the original on 16 March 2018. Retrieved 16 March 2018. ^ Silburt, Ari; et al. (Mohamad Ali-Dib, Chenchong Zhu, Alan Jackson, Diana Valencia, Yevgeni Kissin, Daniel Tamayo, Kristen Menou) (6 Mar 2018). "Lunar Crater Identification via Deep Learning". arXiv:1803.02192. ^ Wood C. A.; Anderson L. (1978). "New morphometric data for fresh lunar craters" (PDF). Proceedings of the 9th Lunar and Planetary Science Conference, Houston, Texas, March 13–17, 1978: 3669–3689. Bibcode:1978LPSC....9.3669W. ^ "Proceedings of the Thirteenth General Assembly (Prague, 1967) – excerpts". The-Moon Wiki. Archived from the original on 2013-09-25. Retrieved 2014-09-01. ^ J. A. Jackson; J. P. Mehl; K. K. E. Neuendorf (American Geological Institute), eds. (2005). Glossary of Geology (5th ed.). Springer Science & Business Media. p. 665. ISBN 978-0-922-15276-6. ^ David T. W. Buckingham; Bitha Salimkumar & Nadine G. Barlow (2011). "Development of a New GIS Database of Lunar Impact Craters" (PDF). 42: 1428. Archived (PDF) from the original on 2011-06-29. ^ "Moon Zoo: Archive". www.moonzoo.org. Archived from the original on 17 October 2017. Retrieved 2 May 2018. ^ a b "Categories for Naming Features on Planets and Satellites". Gazetteer of Planetary Nomenclature. International Astronomical Union (IAU) Working Group for Planetary System Nomenclature (WGPSN). Archived from the original on 2014-08-09. Retrieved 2014-08-24. ^ a b Greeley R.; Batson R. M. (1990). "4.2. Moon: 1640–1977". Planetary Mapping. Cambridge University Press. pp. 97–103. ISBN 978-0-5210-3373-2. ^ "Descriptor Terms (Feature Types)". Gazetteer of Planetary Nomenclature. International Astronomical Union (IAU) Working Group for Planetary System Nomenclature (WGPSN). Archived from the original on 2013-12-10. Retrieved 2014-08-24.